Baby-making with Kane is right up Jade's alley...until a curse throws a bucket of ice on their fire. Jade and Kane are ready to take the next step in their lives together. But after a routine blessing goes horribly wrong, suddenly any thoughts of starting a family are put on hold when Jade is cursed and their future child threatened. Now the hunt is on to find the one responsible in order to break the curse. But life on Bourbon Street is never that straightforward. There are demons to battle, souls to save, and secrets to be uncovered. And as Jade and her friends get closer to the truth, it's starting to look like someone has made a deal with the devil. Do unto others as you would do to yourself! 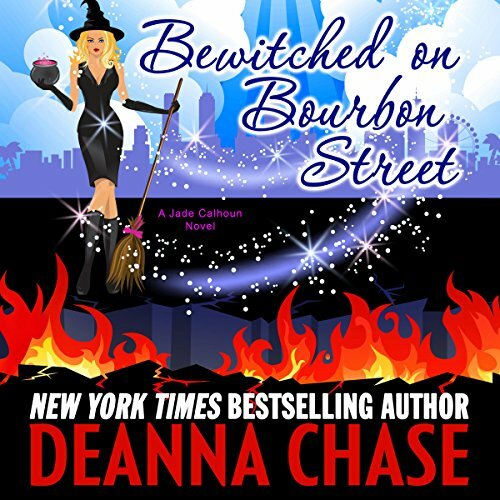 Where does Bewitched on Bourbon Street rank among all the audiobooks you’ve listened to so far? Lives hang in balance as the bubbling pot of troubles comes to head in this book, What happen truly surprising who is on who side is something that will shake up your brain and when all pieces fall back into place. Lives be changed forever! What an amazing way to find out who did what and who truly guilty. I love it. amazing ending. action, drama, mystery and alot of craziness. It was a crazy book but a great ending. So addicted to Deanna Chase. I'm so excited to have found Deannas book. What an awesome way to start my day.